The goal of The Flagway™ Game is to create environments where students can practice and celebrate learning math. There are many different ways to create a cultural context in which mathematics emerges naturally from students’ experience. One method used by the YPP and the Algebra Project is to create mathematically rich games and experiences. The FlagwayGame was developed by Bob Moses in 1995 and patented in 1996 (Moses, U.S. Pat #5520542 & 5704790). 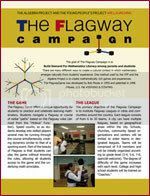 Flagway™ can be played with students as early as 1st grade and has been enjoyed by adults. In general the game is played with 3rd - 6th graders. During game play students navigate a Flagway or course of radial “paths” based on the Flagway rules (derived from the “Mobius” Function). Speed counts, so as students develop into skilled players several may be running through the course simultaneously, creating dynamics similar to that of a sporting event. Part of the beauty of Flagway is that students can play the game without knowing the rules, allowing all students access to the game and the underlying mathematical principles. Research indicates that students performing in the bottom quartile begin a descent from mathematical competency somewhere around Grades 3 and 4. The addition and subtraction of whole numbers seems to be a manageable conceptual task, but the beginnings of multiplication, culminating in division and the arithmetic of fractions, seem to be the Rubicon for this population of students. Cognitive science recognizes two basic mechanisms of memory acquisition: repetition and elaboration. Repetition, the most frequently used method for acquiring multiplication facts in young children, as an empirical matter, has not succeeded with this population of students. Elaboration, as a mode of memory acquisition, is why we remember stories for years but a phone number for only minutes after we first hear it. Flagway™ constructs a meaningful elaboration upon basic number facts by incorporating those facts into a game where students guess, conjecture, reflect on the options in the game, and also tie these mental operations into the kinesthetics of running the patterned network of the game. YPP has created board games and physical games that capitalize on young students’ propensity for running, the galvanizing energy of team competition, and the intrinsic sense of achievement when the team has figured out the correct category for a given number. The primary objective of the concept of "Flagway™ as a Sport", is to develop Flagway™ Leagues in cities and communities around the country. The leagues would create opportunities for teams, coached by highschool and college students, to compete locally, regionally and nationally. Schools, churches, community based organizations and centers would be invited to enter teams in designated leagues. The Flagway™ leagues could additionally sponsor local, regional and national tournaments.